Fan art grabbed from here. Not quiiiite my usual line of stuff, but this seemed like fun. This Labyrinth Lord-based class is for a friend who's a huge fan of Mega Man. It may be a good fit for use in Reynaldo's Barovania campaign setting. HD: d6, 2d6 at first level BUT cannot be targeted with healing magic, can repair 1d3 hp per day (with an additional +1 hp for each day of rest). 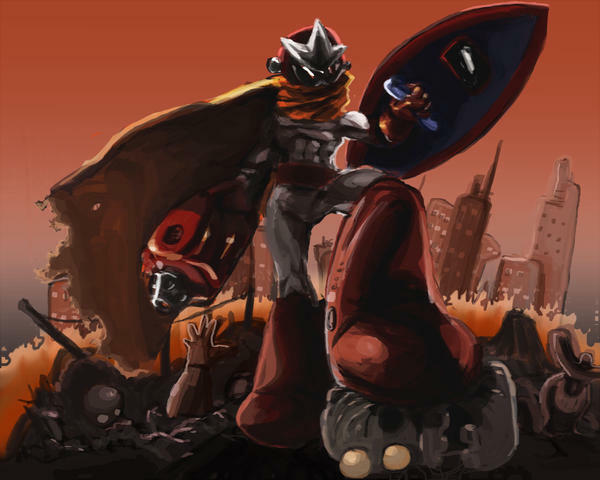 Mega Robots cannot wear more armor - they're already made of metal - but they can increase their defenses by consuming magical armor or shields. Each consumed item improves their AC by one for each +1 or special ability the armor possessed. This can be repeated until the Mega Robot has an AC of 0.